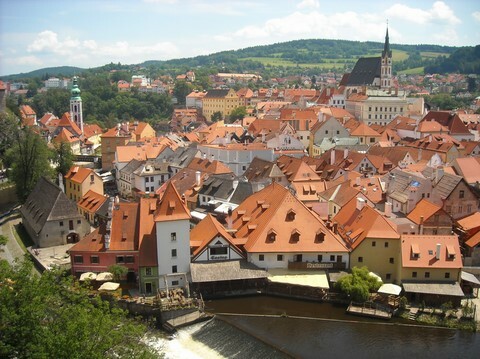 In 2009, we decided on whim to go to Czech Republic. Indeed, we had planned for several weeks to visit Amsterdam. Just before we book our trip, we consulted the catalogue « Visit Europe » to settle the last details before we go to the travel agency to book definitely. Flipping through the pages, we realized that a stay in Prague with a flight from Paris was less expensive than a trip to Amsterdam with a departure from Paris by train. As we had a limited budget, we changed completely our plans at the last moment to sketch hastily a draft to stay in Czech Republic just before we book in the same agency. This unexpected aspect was the charm of this trip. We knew that Prague was a must-see destination. Deemed as one of the most beautiful cities in Europe, we have noted with delight that this was not at all usurped: until today, it's the most beautiful city we have ever visited. However, the rest of the country - little-publicized - remained a great unknown. Finally, we have been amazed by a rich and harmonious nature alternating mountains, majestic forests and verdant countryside, where colorful, scenic cities full of personality blossom. Besides, if you want to rent a car, we recommend you the Royal Rent a Car agency in Prague, which friendly and receptive staff offers very attractive discounts if you pay cash down before you get the vehicle. Departures on whim are often unforgettable. That was no exception to the rule. « The city with one hundred steeples », beautiful and vibrant, proudly displays its churches, convents and castles with their round towers soaring up to the sky. It abounds in Renaissance and Baroque buildings. The Romanesque facades with pastel colors are next to the Art Nouveau facades. 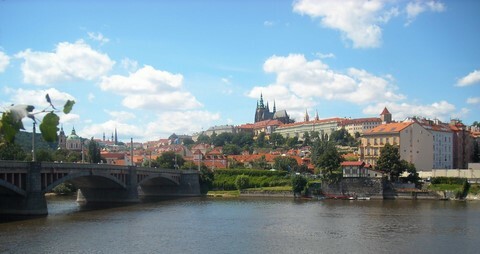 On the banks of the Vltava, splendid River, palaces and mansions are reminiscent of the colors of Venice. Wooded hills or lined with buildings hills are located at the gates of the city. The main attractions are the Astronomical Clock and the Charles Bridge with its petrified saints. At night, streets empty and lights change completely the spirit of the city, which becomes magical and romantic, with a breathtaking beauty. Classical concerts are ubiquitous in monasteries and churches. The Astronomical Clock is a beautiful and amazing work of art six-hundred years old. It is a real attraction that draws crowds every hour. The original mechanism activates the characters : the twelve apostles parade in the central window while the Reaper shakes the hourglass. The miser shakes his purse and the conceited tilts his mirror. The Turkish refuses with a head movement to follow the Reaper. The central dial indicates the position of the Sun, the Moon and the planets according to the Medieval cosmology through three hands. A thunder of applause and clamor welcomes the end of the short show. Malá Strana is a colorful area whose streets are narrow and winding, picturesque and charming. Cobblestones cover sidewalks and pavements. Narrow passages rush into old houses courtyards. Sometimes open-air, they include cafes and terraces. Palaces abound. At nightfall, streets lit by lamps lead to surprising places with a beautiful fountain or a sculpture. Cafes and restaurants are lively. The huge Petrin Hill overlooks the Vltava River. It includes a large rose garden and a nice wooded park with many winding trails. The ascent with the funicular is picturesque and offers a unrestricted view. At the top, a tower that recalls the Eiffel Tower is the highest point of the city. The Prague Castle is a must. Each era added its contribution to the construction of this prestigious grouping, and all architectural styles coexist in perfect harmony, creating an unforgettable panorama. The complex includes a cathedral, many palaces, churches and museums, courtyards and gardens, as well as a music pavilion. In the Vinohrady District, the Riegrovy Sady Park is located on a small hill and surrounded by beautiful Art Nouveau or classic houses with varied colors. A vast lawn on a slope offers a splendid view of the rooftops of Prague, especially at sunset. Then, the Vltava River extends its golden shimmering rippers in the heart of magnificent buildings, in a gripping blaze of light. The atmosphere is young and carefree. In the heart of the park stands a small restaurant (eat in or take out) where you can find many young locals. Feel free to take a local beer, enjoy a sausage in mustard sauce on a slice of whole-wheat bread, overlooking the Czech capital on the parks lawns on a slope. Prague is part of our favorite cities. To have direct access to the rubric, click here. Karlovy Vary, in Western Bohemia, is a spa town wreathed in the typical charm of Central Europe and an undeniable Austro-Hungarian nostalgia. The water comes from twelve hot and therapeutic springs. The discovery of the first source is related to a legend according to which, during a hunt with the hounds, the Emperor Karel IV's dogs and a deer at bay were scalded by a jet of water out of the ground. Then, he decided to build a town which is called after his own name. Located on a narrow valley, it is divided by the Teplá River. Constructions keep homogeneity with beautiful late 19th or Art Nouveau frontages. The Dvořák Park includes the city's largest bathing establishment : the ancient thermal baths. The spectacular Mill Colonnade, neoclassical splendor from the end of the 19th century, proudly shows its one hundred-twenty-four Corinthian columns. The Giesel Colonnade, timber Empire construction on the banks of the Tepla River, is extended by the Market Colonnade, very graceful in its finely chiseled white wood, which houses two other sources. The city is surrounded by wooded hills. At the top of one of them stands an Orthodox Church. You can get to them with the funiculars. The Charles IV belvedere, built in neo-Gothic style, is made up of terraces on two levels. It offers a superb view over the city. Česky Raj, « the Bohemian Paradise » is a 700 km² protected area. Very wooded and hilly, it includes amazing characteristic sandstone formations which make up rocky towns called « skalní ». 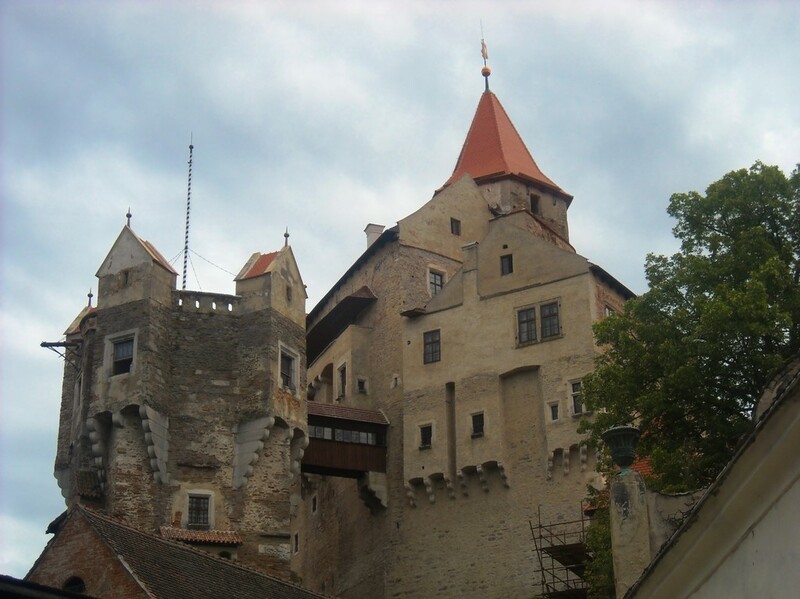 Castles and historic towns add a cultural dimension. Some villages have a remarkable architecture. Česky Krumlov, « the pearl of South Bohemia » is an entrancing city with colorful alleys. UNESCO world heritage site, it has countless treasures to reveal. It has 300 buildings on the historical register. It remained very authentic in spite of summer mass tourism. Crossed by the Vltava River, its site and its natural resources are an essential destination for those who decided to travel around the country. The Castle and the town itself are an amazing blend of styles yet perfectly harmonizing. In a large enclosure at the castle's bottom, you will see with wonder a young tame brown bear which is a real attraction. Česke Budějovice is the largest city of South Bohemia. Its central place is breathtaking : a succession of colored high-quality houses with late Gothic or Renaissance arcades. Gargoyles and coats of arms adorn the Town Hall frontage. On the roof, four statues symbolizing courage, prudence, justice and wisdom are surrounded by superb towers. The small St. Nicholas Cathedral and the ornamental fountain in the heart of the place are real wonders as well. Finally, for beer lovers, a visit to the Budvar brewery is required. The Pernštejn fortified castle is an imposing fortress perched on a hill behind the forests in the south of Moravia built over seven-hundred years. Founded in the 13th century, reworked in the 14th and 16th centuries, many architectural styles make it up, including Gothic, neo-Gothic and Rococo. The result is improbable shapes, angles and outlines. It has a medieval donjon and seigniorial rooms, many winding corridors and narrow staircases. Strange inscriptions of the 16th century mingle with mysterious symbols. It houses many legends, and a dreamlike atmosphere emerges from it. If you head for the Austrian border from Brnó, you will drive with wonder down a road crossing a lake in lush greenery, where the steeple of a church soars up behind the trees on a small island.